Just one boat, but everybody wins! (Left to right) Southport Lions President Dan Diehl, Betsy and Bruce Wilson, Lions Foundation Treasurer Grant Truesdale, Marine Mart Owner Larry Price. 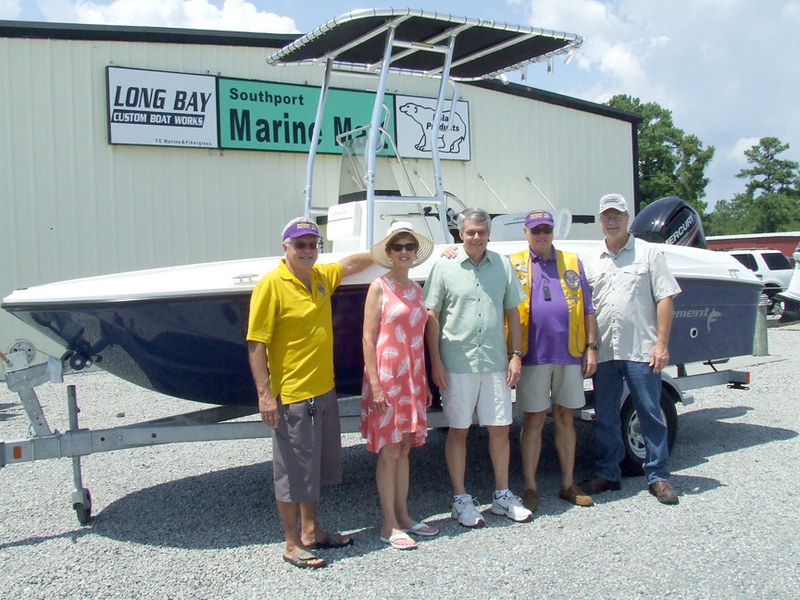 The Boat Raffle has been a major fundraiser for the Southport Lions Club for 20-plus years, and before that it was sponsored by the Southport Jaycees. It has become a Southport annual event leading up to the drawing at the N.C. Fourth of July Festival in Southport. Lion Terry Pope mentioned in his recent State Port Pilot article that “some have indeed been taking part in the tradition for more than 40 years. But while everyone would love to win the boat, many buy (give) because they are very aware it is for a good cause. They know that by buying tickets they have a direct hand in helping the Lions Club assist more than 30 local charities and nonprofits, and provide eyewear, exams, and cataract surgery for those who can’t afford to do it on their own. The campaign begins in April and “ends with a bang” on the Fourth of July. Last year over $28,000 was directed to the local community. There is no overhead or paid position. That is because over 60 volunteers do the job of raising funds and serving the community. Click here to enjoy some memories from the past Boat Raffles.